The Offset function is used to set the vertical position of a waveform and is defined by a voltage value (V). The Position function is used to set the horizontal location of a waveform and is defined by a division value (div). 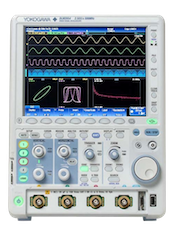 For example, when comparing the timing of two waveforms, it is necessary to adjust both waveform location and voltage scale (V/div). If you change the waveform location by using the Offset function, the base of the waveform changes everytime you change the scale. If the offset is too large, the waveform might even be clipped. The offset voltage setting function is necessary when you want to subtract a certain DC voltage from the waveform.